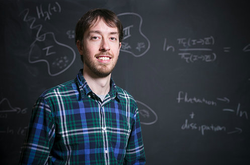 Jeremy is a physics graduate student studying the stochastic thermodynamics of Markov models and their connections to the physics of systems that exhibit emergent information processing capacities. Jacob is a math graduate student who studies the behavior of disordered systems that are driven by fluctuating external fields with complex time-correlations. The goal is to characterize how driven steady-states in such systems accumulate information about the statistics of their environment. Pavel is a physics graduate student investigating the nonequilibrium statistical thermodynamics of emergent computation. His research has focused on the dynamics of systems that exhibit strong time-scale separation between different variables. Weishun is a physics graduate student studying the adaptation and "survival" of the high-free energy metastable states of driven dynamical systems in time-varying environments. Hridesh seeks to use analytical and computational techniques to study the emergence of sensing and decision-making behaviors in the dynamics of evolving mechanical networks subject to complexly correlated external forcing.